For the first time Toyota Field will play host to a non-soccer sporting event as the United States national Rugby Union team will come to San Antonio. The USA will play Uruguay in the opening match of the 2017 Americas Rugby Championship on February 4th 2017. The match will be the first time that the Eagles have played in San Antonio reflecting the benefit of having a venue like Toyota Field in San Antonio. At 8000 seats, the venue is the right size for an Americas Rugby Championship match and has the right sized and shaped playing area. The Americas Rugby Championship is the pinnacle of rugby in the Americas emulating the European Six Nations or SANZAAR’s The Rugby Championship. It consists of six of the seven best ranked sides in the Americas, with Argentina represented by their second team, Argentina XV, who have won every single edition of the tournament, and are yet to lose a match in the tournament. Similarly to the Rugby Championship there are four points for a win, two for a draw and two kinds of bonus points, one for scoring four or more tries and one for losing by less than seven points (one converted try). 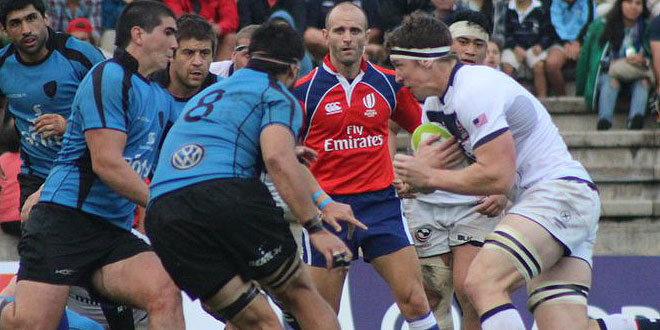 In 2016 the United States finished the Americas Rugby Championship in second place, the third straight competition they finished in that position. The timing of the tournament allows the United States to select players from European teams. That will allow prop Titi Lamositele to be released from Saracens and winger Blaine Scully from Cardiff Blues amongst other clubs. It will be a tight match with the two sides closely ranked, but the United States are the higher ranked team. Uruguay sits at 21st in the latest World Rugby rankings while the United States is sitting in 17th, just four rankings points ahead. Uruguay stunned the United States in 2016 in Montevideo as they managed a 29-25 win over the Eagles. Despite that the United States managed to come second in the tournament in 2016, with a memorable tie against Argentina XV. The earlier reported sale of Toyota Field has finally been finalized, Bexar County and San Antonio leaders announced at a press conference at San Antonio International Airport on Wednesday. The press conference was perhaps a little hastily arranged as the city looked to turn the sport’s media’s attention away from San Antonio missing out on a College Football Playoff but was stunning news for San Antonio Soccer fans. “San Antonio is ready for Major League Soccer” were the words of Mayor Ivy Taylor to open the press conference. That may have overstated the point, as neither Gordon Hartman, nor Spurs Sports and Entertainment were present but the city of San Antonio took a big step towards that goal on Wednesday. While the announcement was not that Major League Soccer had selected San Antonio as an expansion city, it was still significant. The City of San Antonio, Bexar County have joined together to purchase Toyota Field, for a sale price of $21 million and will lease the venue to Spurs Sports and Entertainment. The most significant piece of information revealed at the press conference was the intention to expand Toyota Field as they seek MLS. With that in mind, the city has imposed a clause on SSE which states that they must go to MLS or they will be forced to repay the city their investment. Without Gordon Hartman at the press conference the status of the San Antonio Scorpions is not currently clear. But with SSE investing in Toyota Field, it seems unlikely that the club in its current form survives, and Hartman has previously said that the stadium would not be sold unless the club went with it also. SSE were also not present at the press conference and have not yet released a statement (which has been requested by the San Antonio Soccer Examiner) but will no doubt be seeking control of the club playing at the stadium. Sources have previously mentioned that SSE will take a team to the United Soccer Leagues, but aim for MLS, that clause from the city makes that a requirement. More details about that clause (rumored to be ten years) and the deal surrounding the Scorpions, Toyota Field and SSE’s investment in either or both of these are sure to come out in the coming days. But it is clear that this is certainly another step on the road to MLS. Meanwhile MLS have released a statement following the press conference, which seemed fairly dismissive of the news. “MLS has not yet determined the timing and process for expansion beyond 24 clubs, but look forward to learning more about this project once our future expansion plans are finalized.” Said the statement, the fans of San Antonio soccer can also echo those sentiments.